The Greenwood residential-dining enclave may have lost its hype but not its charm. As a testament to its draw, upscale shabu shabu-sukiyaki-kakigori joint, Sakurazaka, quietly debuted in the balmy estate weeks back with plate glass doors offering passersby a peek of its refined light wood interior. 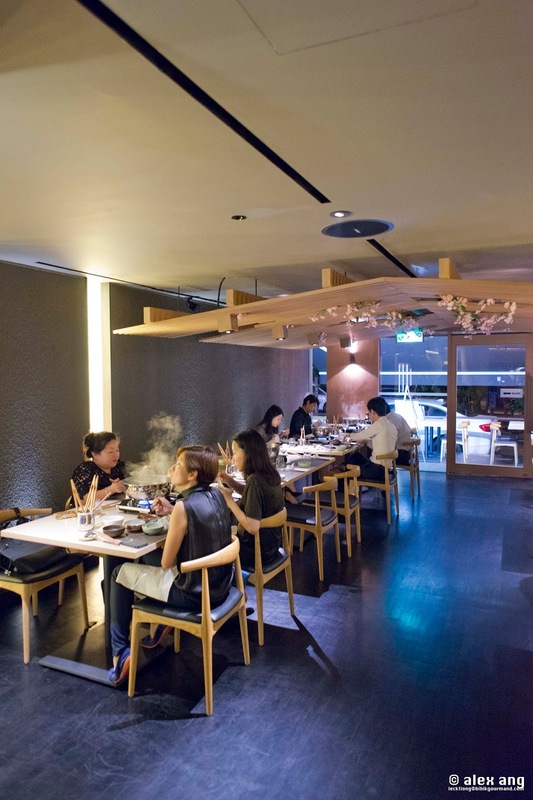 While its look-and-feel complete with low-slung chairs and a set of slated wood ceiling flecked with sakura flowers is fittingly Japanese, this is no ordinary shabu shabu joint. Thanks to consultant chef, Masahi Horiuchi, a native of Fukuoka who spent 21 years in stars-studded dining establishments – including the last 5 years with L’Atelier de Joel Robuchon London – before setting foot in Singapore, Sakurazaka’s menu is unmistakably Japanese but it is uninhibited in its embrace of European influences. From the Shirobuta pork, Aomori Japanese rice-fed beef, Joshu wagyu and Japanese wagyu-holstein crossbreed that headline the menu, Sakurazaka makes no compromise on the quality of its Japanese meats. But to reach a wider audience, the restaurant also offers beef consommé and bouillabaise soup stock on top of the stable of four types of Japanese stock (chicken, pork, ago dashi and soya milk). In addition to the standard range of cabbage, mushrooms, leek and tofu, vegetables like fennel, asparagus and endives also make an appearance on the a la carte and – selectively – on the bouillabaisse set. 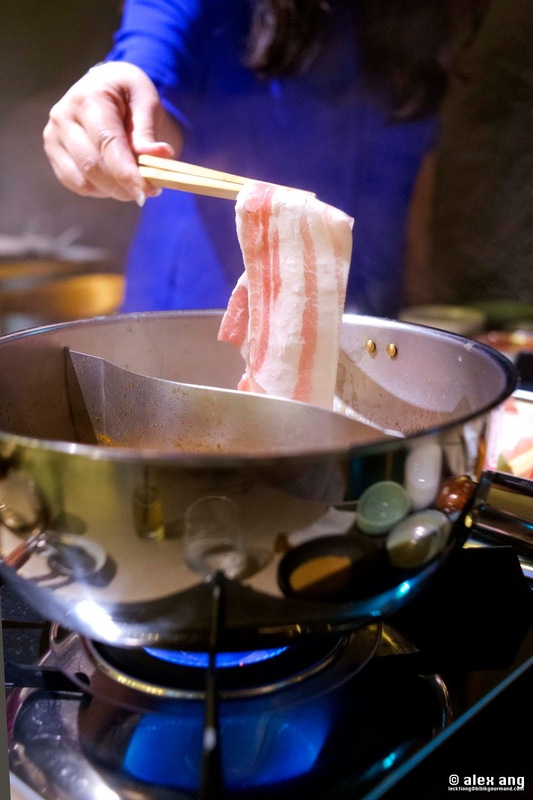 Whilst it’s perfectly possible to eat from the a la carte, the most economical way to savour Sakurazaka is to pick from one of four set menus – the pork shabu shabu set (S$95 for two featuring Shirobuta pork belly and pork loin), the bouillabaisse shabu shabu set (S$108++ for two featuring five types of seafood), the beef shabu shabu set (S$128++ for two featuring Aomori rice-fed sirloin and ribeye) and the sukiyaki set (S$150++ for two featuring Japanese wagyu-holstein crossbreed striploin and ribeye). With each order of shabu shabu set, diners are afforded an opening starter of either beef, pork or seafood ishiyaki (stone grill), two cuts of beef or pork (seafood in the case of the bouillabaisse set), an assortment of five types of vegetables, two types of Japanese mushrooms, a choice of egg noodles, udon or Japanese rice (only udon or Japanese rice in the case of the sukiyaki set), a choice of two broths, three types of dipping sauces (sesame, tamari ponzu and shio ponzu) and a dessert of kakigori. 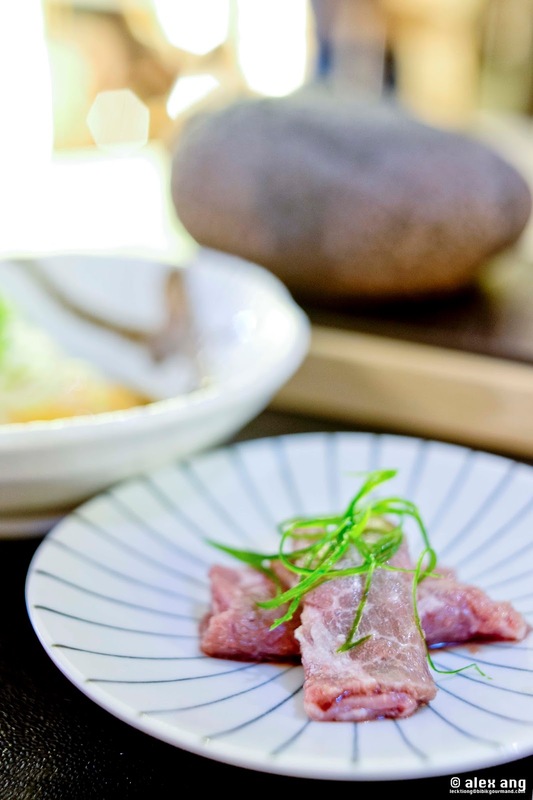 Each set has its merits but if we were to visit again, the broth choices are clear as day – the elegant yet light ago dashi broth and the full-bodied pork broth. We also have a preference for both the pork and the beef sets, as opposed to the bouillabaisse set that is served with seafood. 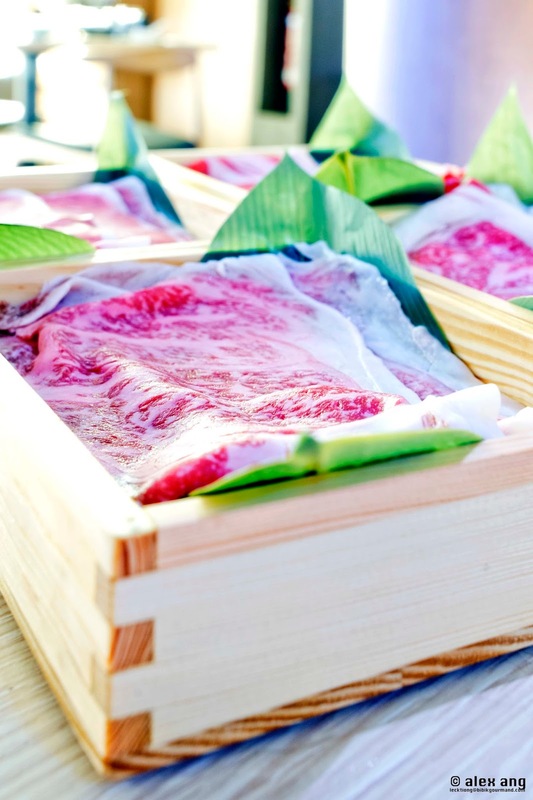 Meat lovers will particularly adore the Shirobuta (white pig) pork belly from the pork set and the marbled Aomori rice-fed ribeye and striploin from the beef set. 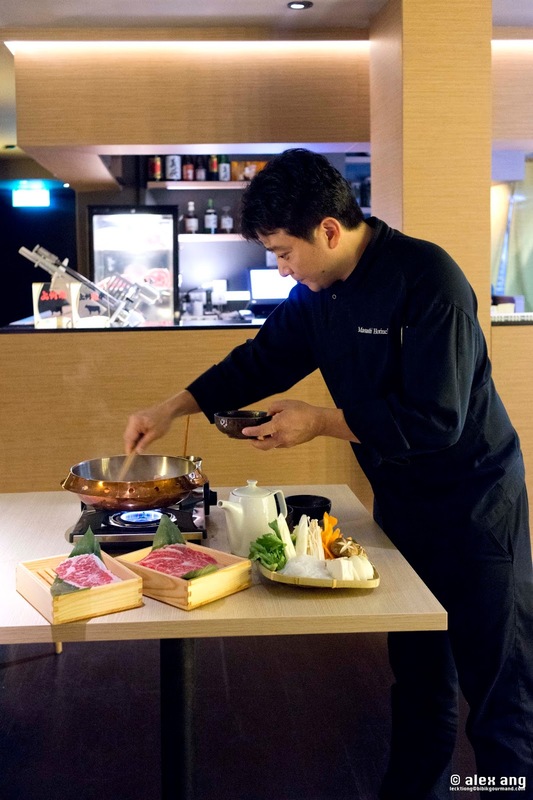 Diners with a preference for stronger – if sweeter – flavours sans the broth have an added sukiyaki set option where Japanese wagyu-holstein crossbreed beef is cooked with vegetables in a beef fat-oiled pan moistened with a cocktail of soy sauce, sugar, sake and mirin. To set itself apart from the garden-variety shabu shabu joint, Sakurazaka offers kakigori (or Japanese “ice kachang”) desserts on both the a la carte menu and bundled in all sets. 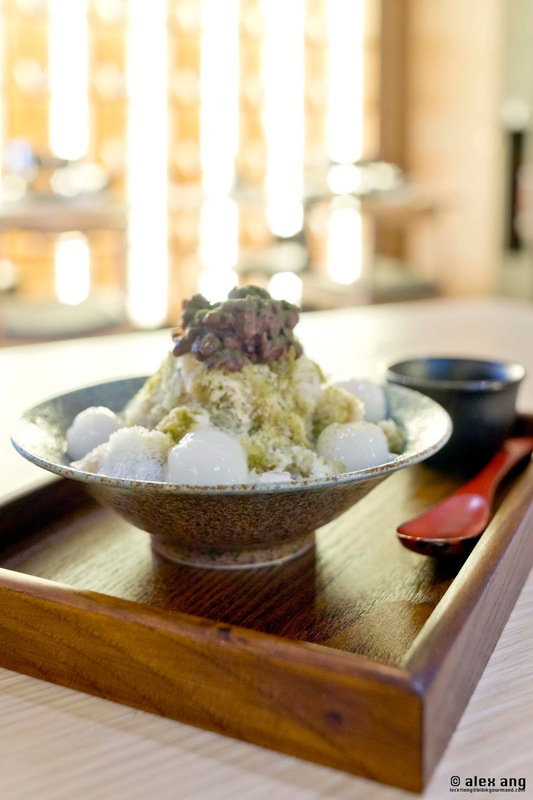 Options range from the western influenced port wine and tiramisu kakigori to the more endearing Japanese flavours of ujikintoki (matcha green tea) and Hokkaido milk. In time to come, the restaurant will make available its array of kakigori for afternoon tea. Until then, the wallet-friendly shabu shabu and sukiyaki sets are reasons enough for marbled meat lovers to put Sakurazaka on fast dial.